Vienna, VA – In a high-flying narrative flashing between the life of American pilot Ned Thomas and events of World War II, Nedda Thomas recreates her father’s most dangerous missions. Lethal and capricious weather conditions, radio silence and the uncharted terrain of the “roof of the world” meant the pilots put their lives at risk every time they took off. 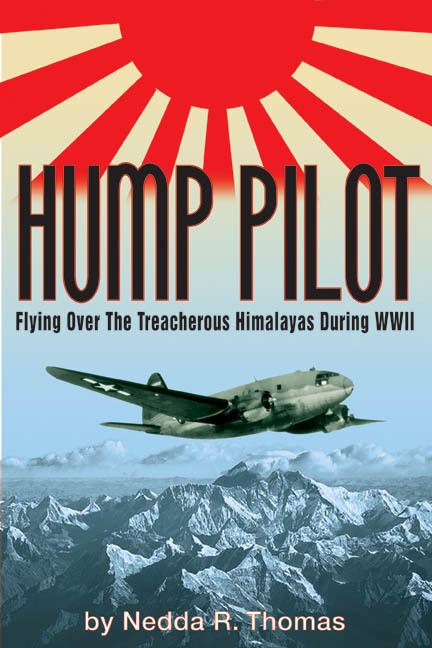 In Hump Pilot (The History Publishing Company), author Nedda Thomas pays homage to the pilots who made it possible for the U.S. to reach victory in the Pacific, interweaving the story of the dashing young pilot who also won the heart of the woman destined to become his wife, the romance that brought her into existence. Pilots of the Hump, as they called this critical air-supply route over the Himalayas, faced the most hazardous flying and highest fatality rates of any air-war mission in World War II. The airlift was the largest the world has ever known, setting the bar for all others to come, including Berlin and Korea. Calm, genuine, young and courageous, Ned brings a human dimension to the story of the Hump. The forbidding Himalayas, Sanskrit for House of Snow, tell their own tale of beauty, danger, and military significance. American climber Clayton Kuhles’ recent expeditions into the Himalayas to recover the remains of downed Hump aircraft have helped gain for these lost pilots a new and passionate public. “The Hump is a larger-than-life epic that deserves to be told,” Thomas says. “And how better than through the eyes of a man who experienced it, my father, Ned Thomas, who brought me up to speed on aircraft and flying in the Pacific Theater.” It is a story of courage and historical significance, told through the life of a brave man who takes our hearts into the sky. Nedda Thomas is a poet and has worked as magazine editor and published a number of articles about creative and interesting historical figures. Growing up in a military/diplomatic family and living in the U.S., France, and the Far East, all expanded the author’s world view. She holds a master’s degree in human development, and also attended seminary. Family memories help nurture her passion for history; she speaks French and English and lectures on several different topics.